2 eAuthentication Before accessing the Delphi eInvoicing System, you must be an authenticated user. This authentication process is called eAuthentication. 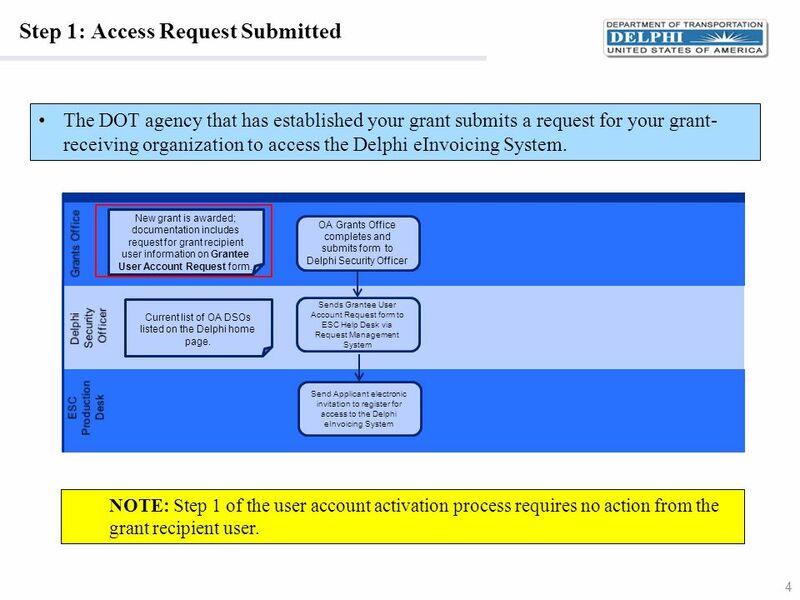 Here are the steps required to activate your account: Once a DOT agency has established your grant, the agency submits an access request for you to access the Delphi eInvoicing System. 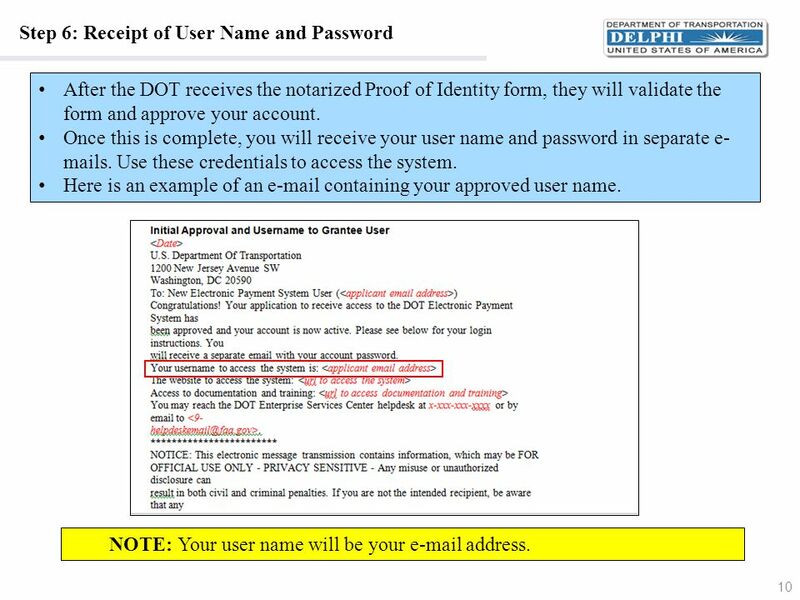 You will receive an invitation to register from the DOT. You will complete the Online Registration form. You will complete and print of Proof of Identity PDF form. 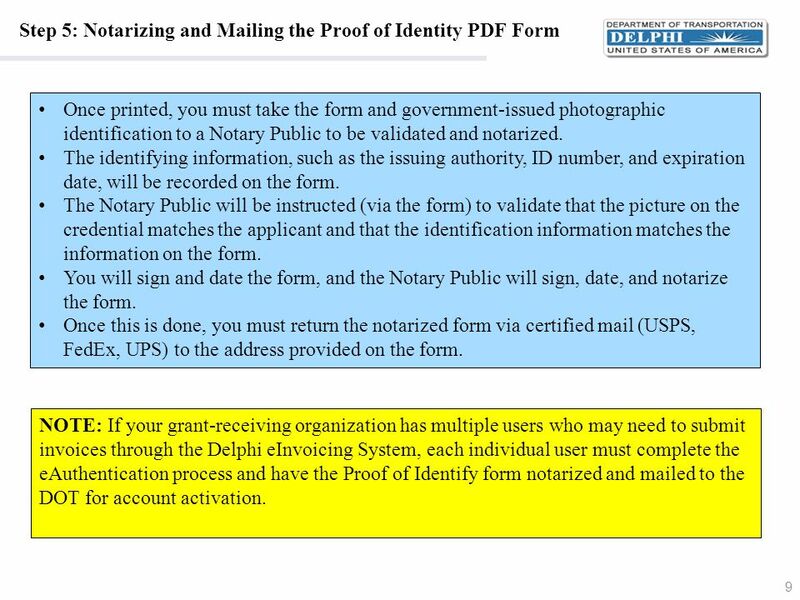 You must have the Proof of Identity form validated by a Notary Public and mail the notarized form to the DOT. The DOT will then validate the forms and approve your account, at which point you will receive separate s with your user name and password. 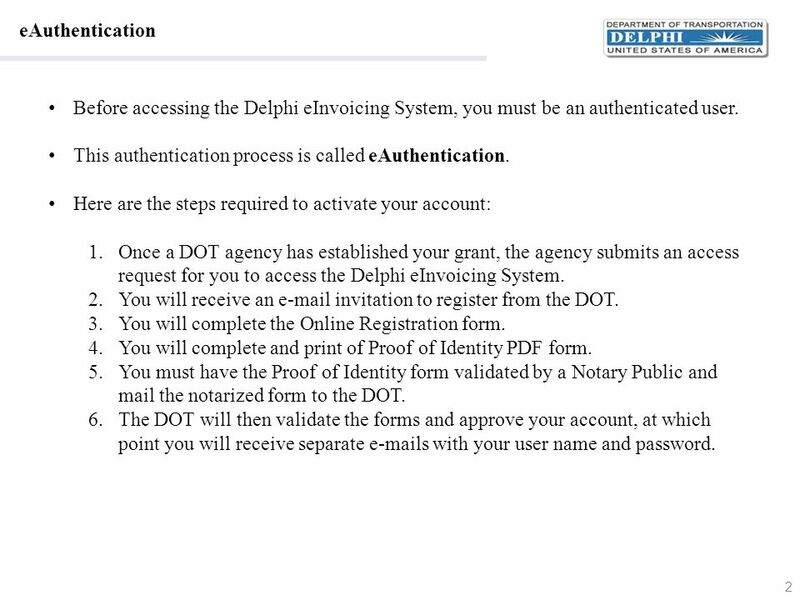 The DOT agency that has established your grant submits a request for your grant-receiving organization to access the Delphi eInvoicing System. 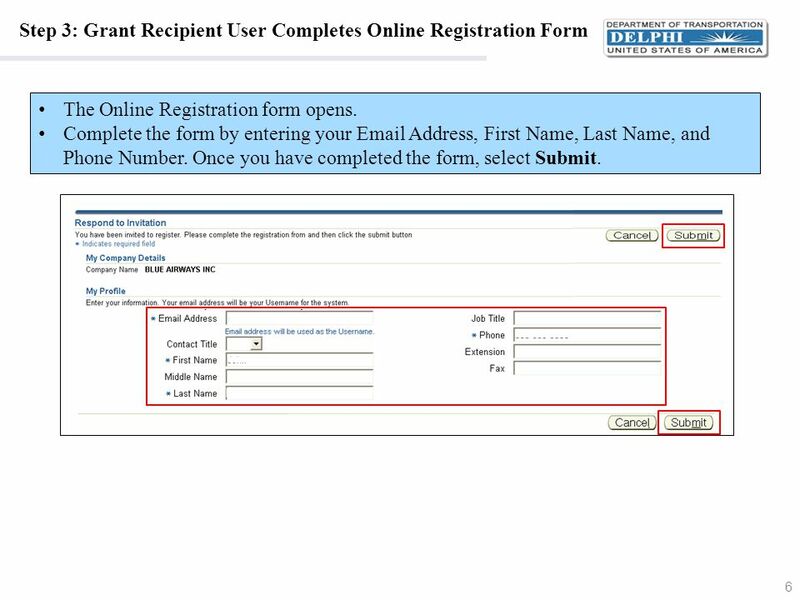 New grant is awarded; documentation includes request for grant recipient user information on Grantee User Account Request form. OA Grants Office completes and submits form to Delphi Security Officer Grants Office Current list of OA DSOs listed on the Delphi home page. Sends Grantee User Account Request form to ESC Help Desk via Request Management System Delphi Security Officer ESC Production Desk Send Applicant electronic invitation to register for access to the Delphi eInvoicing System NOTE: Step 1 of the user account activation process requires no action from the grant recipient user. 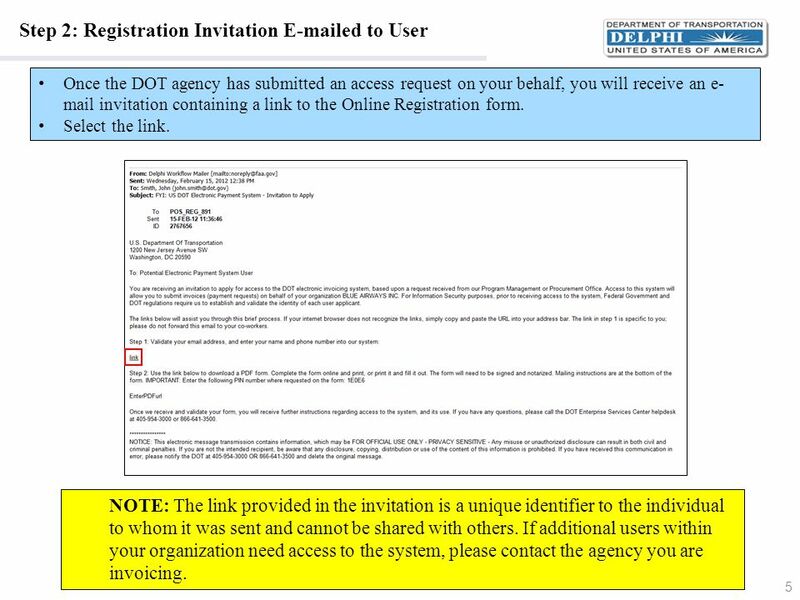 Once the DOT agency has submitted an access request on your behalf, you will receive an invitation containing a link to the Online Registration form. Select the link. NOTE: The link provided in the invitation is a unique identifier to the individual to whom it was sent and cannot be shared with others. If additional users within your organization need access to the system, please contact the agency you are invoicing. The Online Registration form opens. Complete the form by entering your Address, First Name, Last Name, and Phone Number. Once you have completed the form, select Submit. After completing the Online Registration form, return to the invitation. 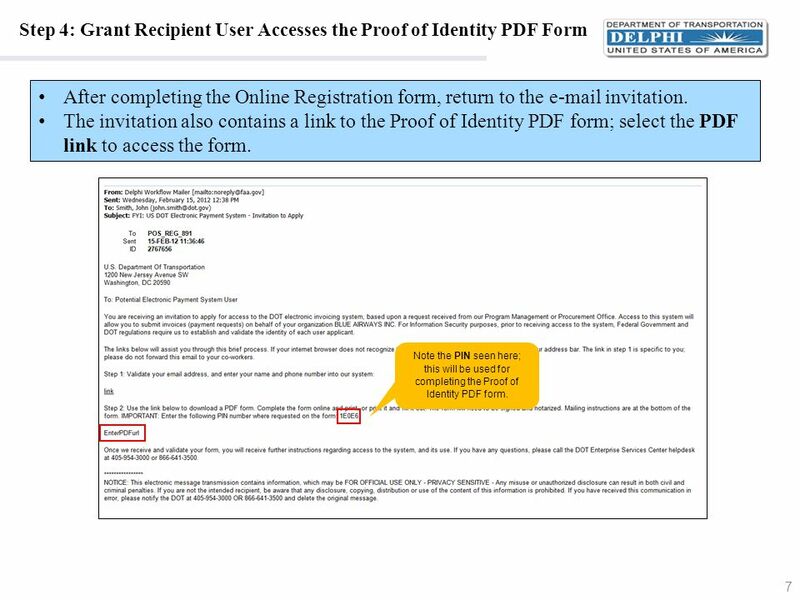 The invitation also contains a link to the Proof of Identity PDF form; select the PDF link to access the form. Note the PIN seen here; this will be used for completing the Proof of Identity PDF form. 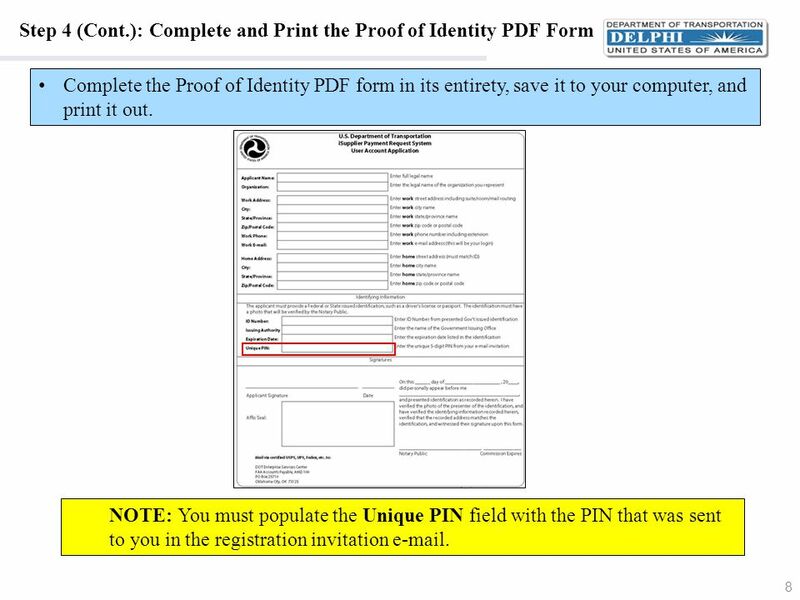 Complete the Proof of Identity PDF form in its entirety, save it to your computer, and print it out. NOTE: You must populate the Unique PIN field with the PIN that was sent to you in the registration invitation . Once printed, you must take the form and government-issued photographic identification to a Notary Public to be validated and notarized. The identifying information, such as the issuing authority, ID number, and expiration date, will be recorded on the form. The Notary Public will be instructed (via the form) to validate that the picture on the credential matches the applicant and that the identification information matches the information on the form. You will sign and date the form, and the Notary Public will sign, date, and notarize the form. Once this is done, you must return the notarized form via certified mail (USPS, FedEx, UPS) to the address provided on the form. 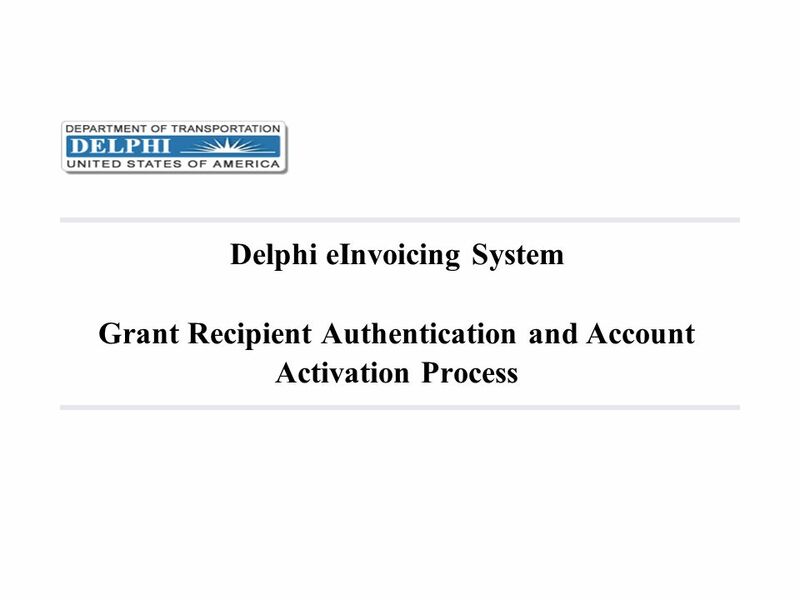 NOTE: If your grant-receiving organization has multiple users who may need to submit invoices through the Delphi eInvoicing System, each individual user must complete the eAuthentication process and have the Proof of Identify form notarized and mailed to the DOT for account activation. After the DOT receives the notarized Proof of Identity form, they will validate the form and approve your account. Once this is complete, you will receive your user name and password in separate s. Use these credentials to access the system. Here is an example of an containing your approved user name. NOTE: Your user name will be your address. Here is an example of an containing your approved password. 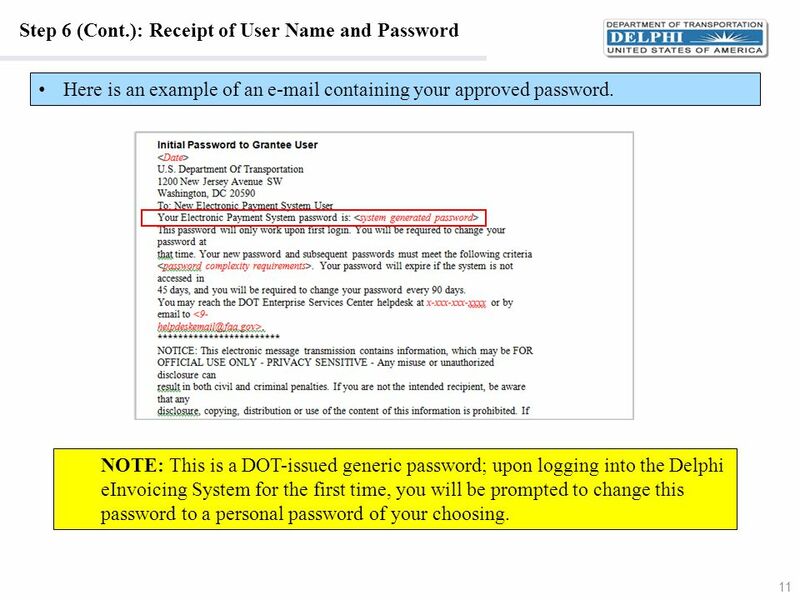 NOTE: This is a DOT-issued generic password; upon logging into the Delphi eInvoicing System for the first time, you will be prompted to change this password to a personal password of your choosing. Once you have completed the registration process and obtained your user name and password, you can access the Delphi eInvoicing System. You should activate your system account within 90 days of receiving your credentials to prevent your account from being deactivated. 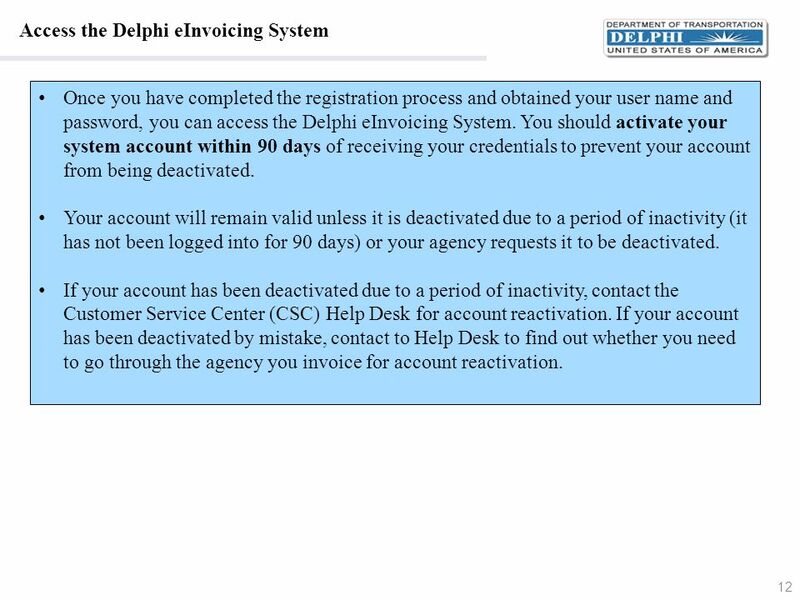 Your account will remain valid unless it is deactivated due to a period of inactivity (it has not been logged into for 90 days) or your agency requests it to be deactivated. If your account has been deactivated due to a period of inactivity, contact the Customer Service Center (CSC) Help Desk for account reactivation. If your account has been deactivated by mistake, contact to Help Desk to find out whether you need to go through the agency you invoice for account reactivation. 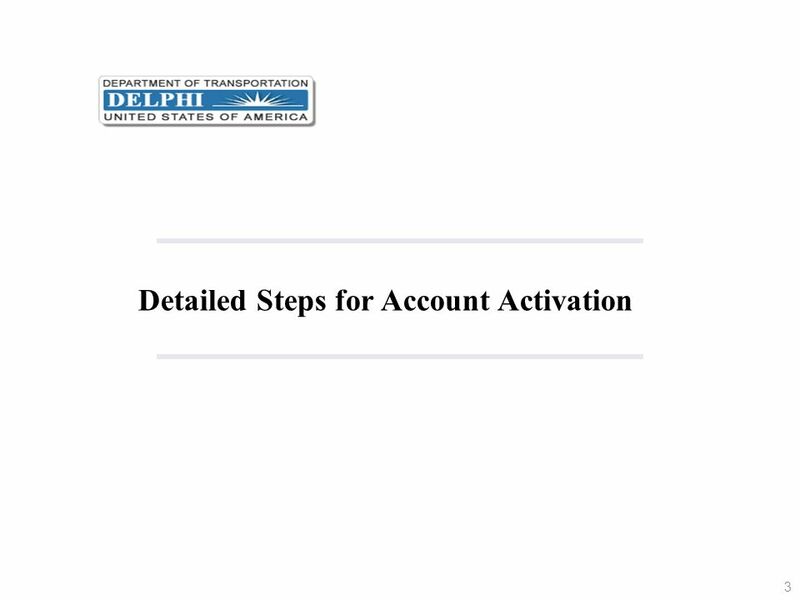 Download ppt "EAuthentication Before accessing the Delphi eInvoicing System, you must be an authenticated user. This authentication process is called eAuthentication." 1.Click on the Need a login? Click here. link directly beneath the login boxes. 2.Enter your social security number & birth date. When finished, click. How to Submit a Matching Gifts Application. Slide 1 of 28 Welcome to GSA’s Vendor and Customer Self Service (VCSS) course Section 2: VCSS Account Registration & Requesting Access This presentation. Confidential 1 Electronic Prescribing of Controlled Substances: Prescriber Identity Proofing and Credentialing Part 2 of a 3 Part Series Chuck Klein, Ph.D.
1 of 4 This document is for informational purposes only. MICROSOFT MAKES NO WARRANTIES, EXPRESS OR IMPLIED, IN THIS DOCUMENT. © 2006 Microsoft Corporation.